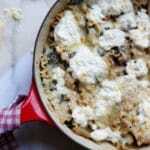 Skillet Lasagna with Mushrooms & Spinach (Gluten-Free) | From Scratch Fast - Recipes & meals from scratch for busy cooks! 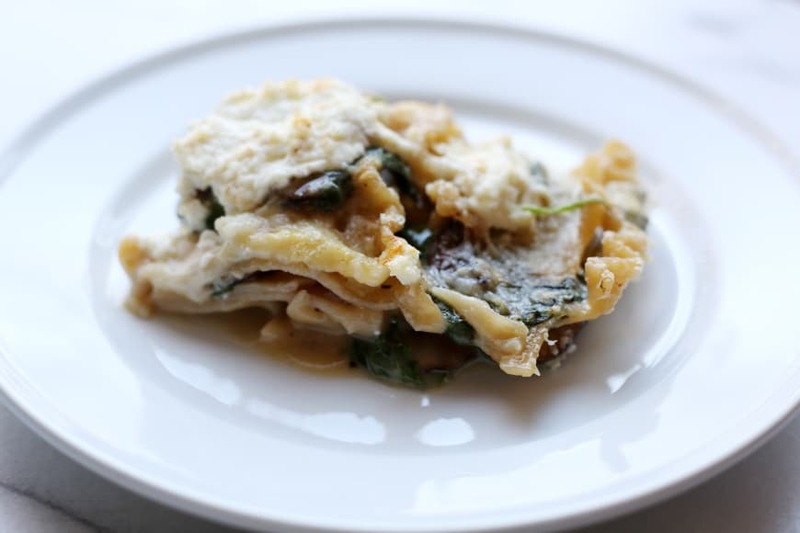 Did you know that you can make homemade lasagna from start to finish in under an hour?! 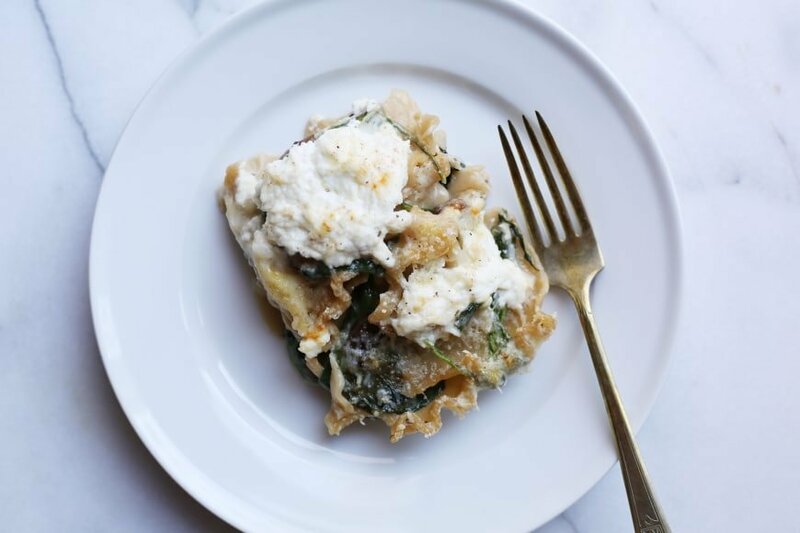 This lightened-up skillet lasagna, brimming with mushrooms and spinach, forgoes béchamel sauce for an easy broth base and is finished with fontina and fresh ricotta. Rather than getting layered in a casserole dish, the whole thing is made right in a skillet. I’d argue it’s even more tantalizing than the properly stacked version—it’s seductively unkempt, like Julia Robert’s hair in Pretty Woman (without the wig, of course). “I don’t know if dinner is going to work tonight,” I told James one Sunday evening a few weeks ago. I was testing this recipe for the first time, and it was a complete experiment. My brother first told me about skillet lasagna, and I was instantly intrigued. Homemade lasagna, in under an hour?! 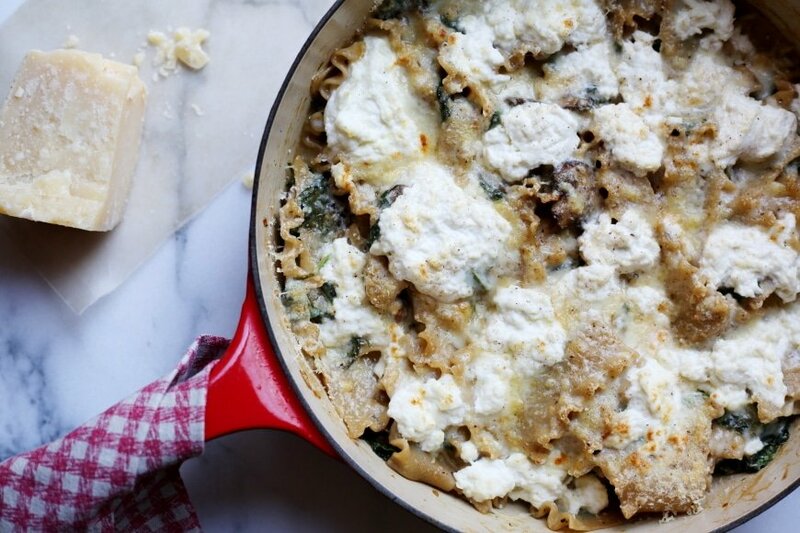 After a quick Google search, I realized that skillet lasagna is decidedly a thing right now. However, nearly every single version I saw was tomato and meat or sausage based. I was craving something lighter and creamier. I sautéed some mushrooms with shallots, garlic and thyme, and deglazed the pan with white wine. Instead of going to the trouble of making a béchamel, I simply added crème fraiche to broth and thickened it with a touch of cornstarch. In went broken lasagna noodles. I covered the pan and crossed my fingers. It didn’t work. Ok, back-up; it worked, but it was more like soup that first test—delicious, but way too brothy. I kept the same concept, but tinkered with some of the measurements. After a few more tries, I got it just right. The lasagna gets finished with grated fontina, a few dollops of fresh ricotta and a shower of Parmesan. It’s then popped under the broiler until it turns golden and crusty along the edges. The lasagna is supremely comforting and yet surprisingly light. Ella and I divvy up the crusty edges (our favorite) while James and Juniper go straight for the creamy center. 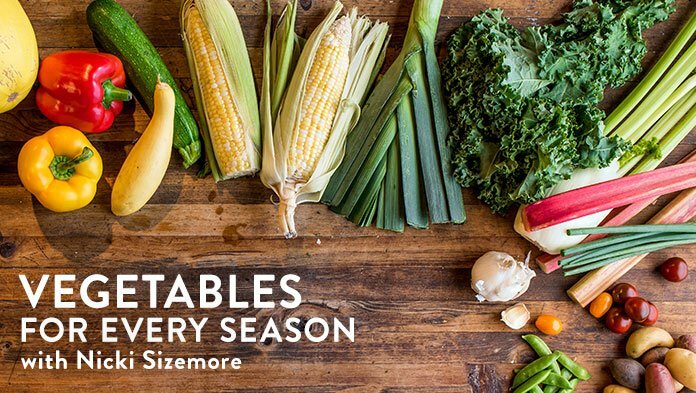 While the recipe isn’t hard, there are a lot of time-sensitive steps. I suggest getting the shallots, garlic and thyme chopped, as well as the wine and broth ready to go before beginning (this will help keep you sane). Once the lasagna is simmering away, you can shred the cheese (and tackle some dishes, if you’re really motivated). The skillet lasagna can be made several hours or even a day in advance. In fact, I prefer it after it’s had a chance to rest for a spell. It reheats wonderfully, making it perfect for entertaining or for holiday potlucks. 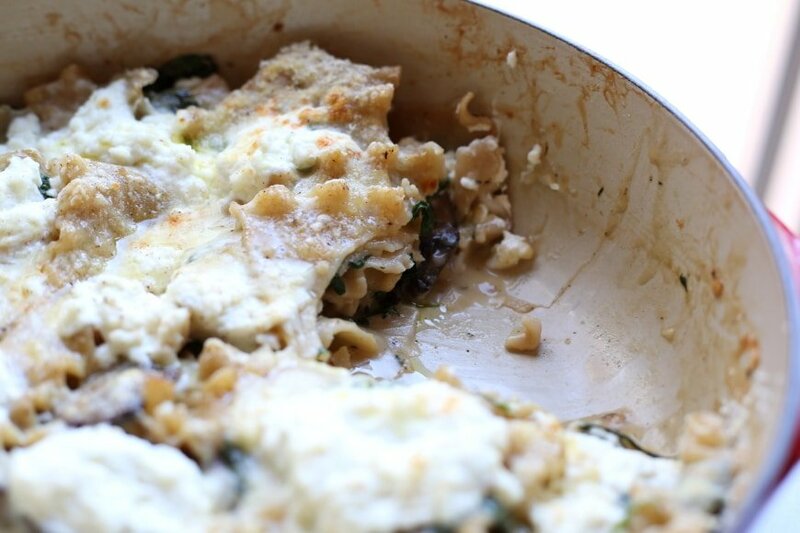 This lightened-up skillet lasagna, brimming with mushrooms and spinach, forgoes béchamel sauce for an easy broth base and is finished with fontina and fresh ricotta. Rather than getting stacked in a casserole dish, the whole thing is made from start to finish right in a skillet, in under an hour! While the recipe isn’t hard, there are a lot of time-sensitive steps. I suggest getting the shallots, garlic and thyme chopped, as well as the wine and broth ready to go before beginning (this will help keep you sane). Once the lasagna is simmering away, you can shred the cheese (and tackle some dishes, if you’re really motivated). The lasagna can be made several hours or even a day in advance. In fact, I prefer it after it’s had a chance to rest for a spell. It reheats wonderfully, making it perfect for entertaining or for potlucks. Heat the olive oil in a 12-inch straight-sided skillet or cast iron pan (with a lid) over medium-high heat. 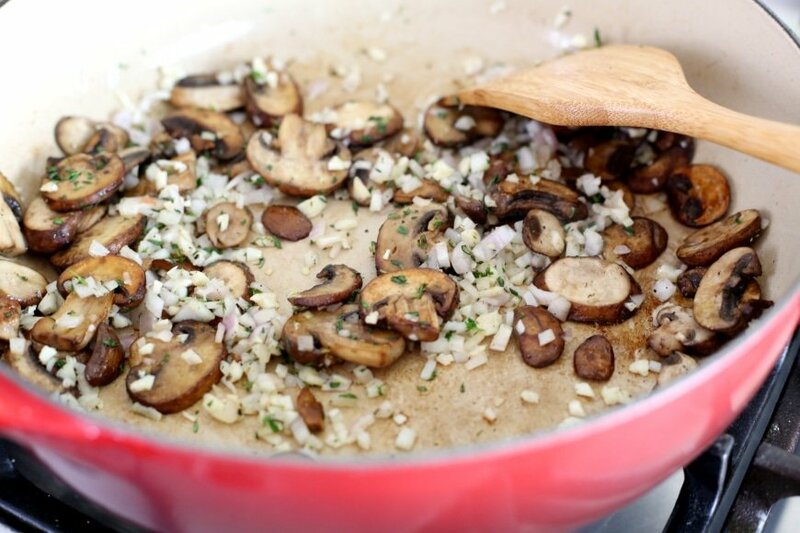 Once the oil is hot, add the mushrooms and toss to coat. Let the mushrooms cook, undisturbed, until they begin to caramelize on the bottom, about 3 minutes. Give them a stir and cook until tender, about 2 minutes longer. Add the shallot, garlic and thyme, and season with a pinch of salt and pepper. Cook, stirring, until the shallots and garlic are softened, about 1 minute. Add the wine and cook, stirring, until almost evaporated. Add 3 cups of the broth and bring to a simmer. 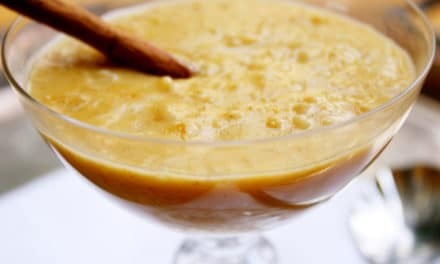 Pour the remaining ¾ cup of broth into a bowl and whisk in the cornstarch. Add the crème fraiche and whisk until smooth. Slowly pour the mixture into the skillet, whisking. Bring to a boil while whisking. Add 1 ½ teaspoons of salt and season generously with pepper. 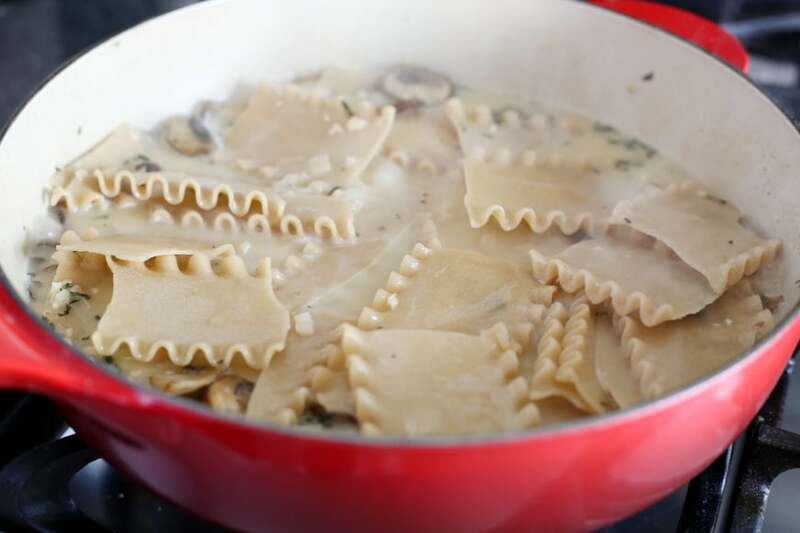 Break each lasagna noodle into roughly 4 pieces and drop them into the sauce (it’s ok if there are smaller pieces). Once all the noodles have been added, give them a stir to coat, and then arrange the noodles in a flat layer (not all of the noodles will be covered). Reduce the heat to a simmer. Cover the skillet and cook 18-20 minutes, stirring twice during the cooking time, until the noodles are tender when pierced with a knife. When the noodles are almost done, preheat the broiler with the rack in the upper third. 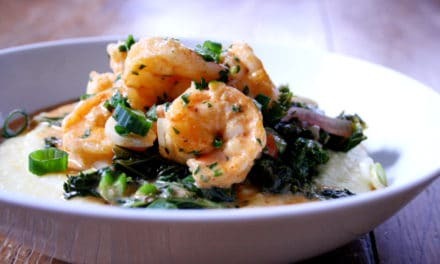 Once the noodles are tender, add the spinach by the handful and gently stir until wilted. Season to taste with salt and pepper. 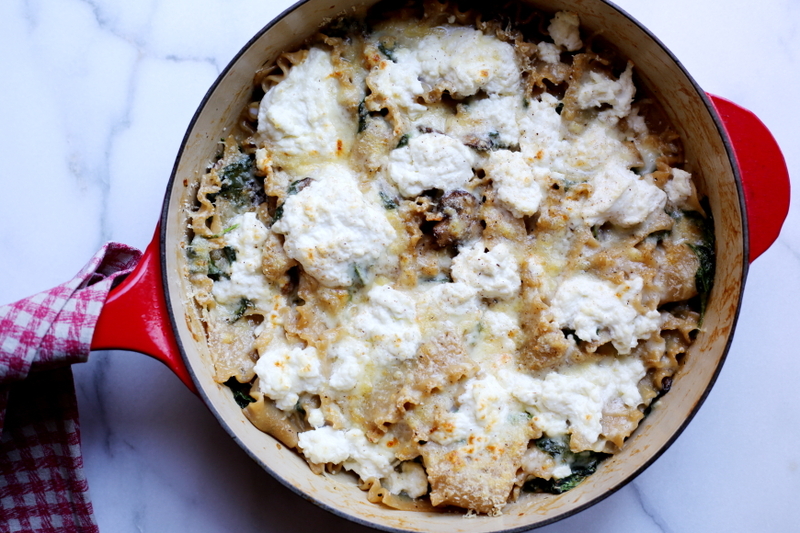 Sprinkle the fontina evenly over top of the lasagna, then dollop with the fresh ricotta. Finish with the Parmesan (I just grate it right over top, eyeballing). Grate some fresh nutmeg over top if you have it. Place the pan in the oven under the broiler. Broil until the cheese is golden in spots (it takes about 5 minutes under my broiler, but every model is different). Let cool 5 minutes. Drizzle with truffle oil if desired, and serve. Do Ahead: The lasagna can be covered and stored in the fridge for up to 2 days. 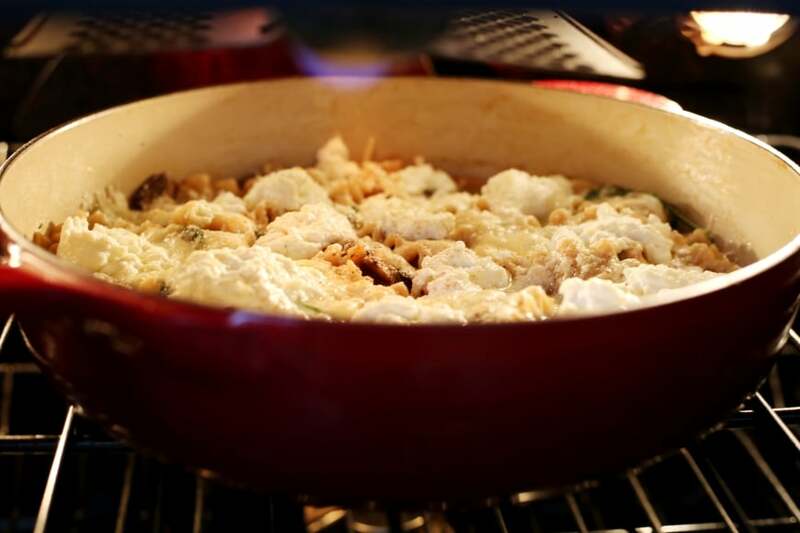 Reheat it in a 350˚F oven until warmed through. 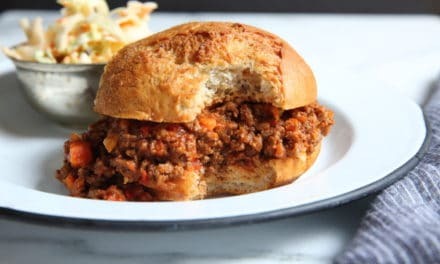 Healthy Sloppy Joes: even better than you remember!